E Five Racing Thoroughbreds' brilliant Rushing Fall took the lead out of the gate and held off a late bid from stablemate Rymska (FR) by a length to win the 31st running of the $350,000 Jenny Wiley (G1) for fillies and mares before a sun-splashed Saturday afternoon crowd of 34,527 at Keeneland in Lexington, Ky. The Jenny Wiley victory was worth $210,000 and increased Rushing Fall's earnings to $1,518,000 with a record of 8-7-1-0. She also earned her fourth Keeneland stakes victory to tie her with Take Charge Lady for the second most stakes wins at Keeneland behind only Wise Dan's seven stakes victories. The victory in the Jenny Wiley was the third for both trainer Chad Brown and jockey Javier Castellano. Making her first start since winning last fall's Queen Elizabeth II Challenge Cup (G1) and her first start against older runners, Rushing Fall was sent to the lead by Castellano and led the field of eight through fractions of :23.81, :48.41 and 1:13.62 while owning a daylight advantage. Rushing Fall's other Keeneland victories came in the Jessamine (G3) in 2017 and last spring's Appalachian (G2). She is a 4-year-old Kentucky-bred daughter of More Than Ready out of the Forestry mare Autumnal. 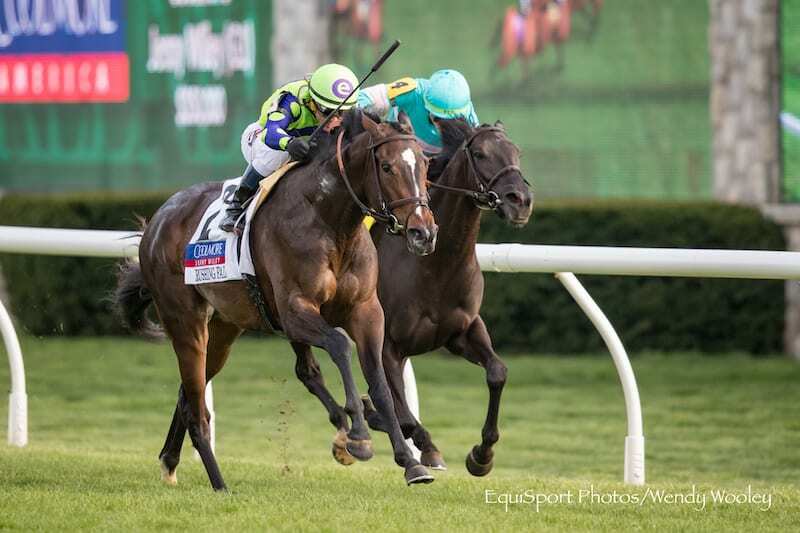 This entry was posted in NL List, Racing and tagged Chad Brown, e5 racing, Javier Castellano, Jenny Wiley Stakes, Keeneland, rushing fall by Press Release. Bookmark the permalink.